Poor Mojo's Classic Squid: Squid "Notes From The Giant Squid: Doctor Roper, Party Animal of the Dead"
Have you seen Doctor Roper? What you and those fools at the Smithsonian do not understand is that the photographique of Misseur Roper must be rotated by 90 degrees to the leftward, sinister-side. In that context it is clear that the Senor-ito Roperino is, as The Robert would say, "Raising High of the Roof-beam, my hip-hop carpenterinos" (Rob's fascination with both Flava-flav and Jerome Salinger knows no bounds). Obviously not killed at the time, it wasn't until 1983 that Sorrow met his fateful end. While follow the Michael Jackson Look-A-Like Thriller tour through Polynesia, Sorrow got embroiled in a prank on the sea otters of Tonga. The short version is that he washed ashore the coast of New Zealand wrapped in kelp and covered in pink sequins. Doctor Roper, visiting New Zealand at the time and ever sensitive to the needs of Squid Kind, had taken Sorrow it seems on his death swim. 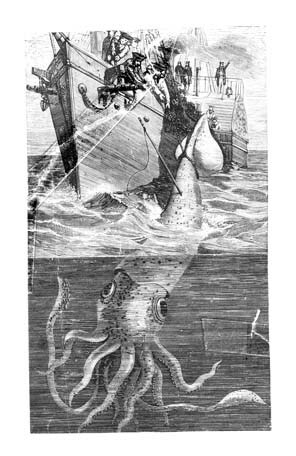 A Squid Death Swim is that peculiar funerary practice that a human might imagine as a combination, infernal, of the Wake, the Black Mass and the Weekend at the Bernard's (now deceased). According to traditional Squid custom, the body of the newly dead should be wrapped in the skin of his closest love and his fiercest enemy. Thence, the second-closest of friends was to take him from gathering to gathering, bringing to his form the semblance of festive spirit and bringing to his beak the liquors most sweet. Finally, several sacrifices were to be made to the deep crevice elders, several of spiritual, several of corporeal and several monetary... the last usually included a prized personal collection of some sort. Roper shipped the body back to Washington DC and the Smithsonian for this final of journey's to honor our dearly departed comedian. Roper, in classic style, attempted to recreate on the surface, as best as possible, this honored Architeuthic tradition, by taking the en-glassed corporeal shell of Sorrow on a tour of many of the fine District Clubs within a days drive of the Smithsonian. He wrapped Sorrow's body in the skin of a dead cat (road kill) and some whale skin filched from his lab partner's preservation tank. Finally, at the end of the night, Roper and his decaying partner in dancing crouched by a sewer grate where they poured out a forty of malt liquor, a change purse of pennies and a plastic lunch baggie of one hundred pogs into the awaiting hands of several CHUDS. Dance long you Amish-bearded fool, for the disc spinning DJ in the terrible upspace comes for us all eventually.